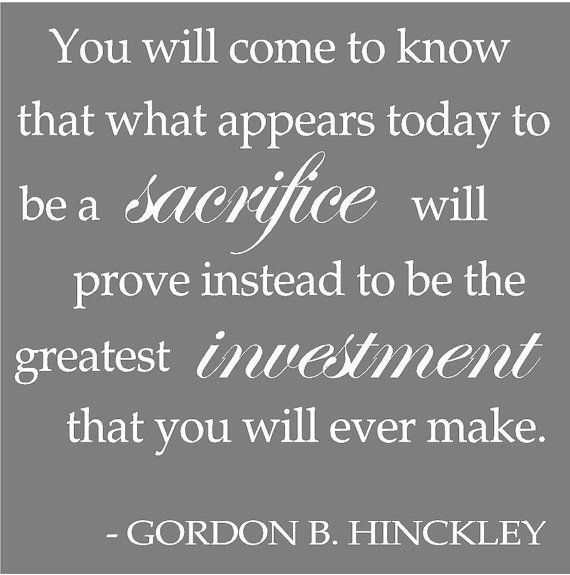 Do you have things in your life you are sacrificing for? There are so many right! I think we often sit and think we shouldn’t have to sacrifice for things. We somehow think that sacrificing is antiquated. Not only that, it isn’t fair. We feel entitled to the life we dream of and we feel entitled to it now. What are some of the things we sacrifice? We sacrifice material things. We might not have as nice of a car, big of a house, or stylish of cloths as we have envisioned for ourselves. The idea of waiting to save up for something is pretty absurd–we deserve it now! Why should we have to sacrifice and save for something? We often need to sacrifice our time in order to help others in various capacities. If we want to be in good shape, we might need to sacrifice favorite foods and precious sleep time in order to get that workout in and reach our fitness goals. And when it comes to parenting, what don’t we sacrifice! But should we really be required to sacrifice money, time, travel dreams, career ambitions, and a clean house (among very few things) in order to be a parent? I believe that sacrifice is a good thing. I believe sacrificing leads us to be better, kinder, more loving, more patient, and more content people. As a parent, there are many things you will need to sacrifice. Sometimes that will mean instead of cleaning up that big mess, you spend some time playing with your child. Sometimes that will mean you feel like you spend every other holiday locked up in some far off room with a baby while the rest of the family parties. Sometimes that will mean letting your child learn to sort something out herself instead of running to her rescue every time, whether sleep training a baby or listening to a child talk about a mean girl at school. 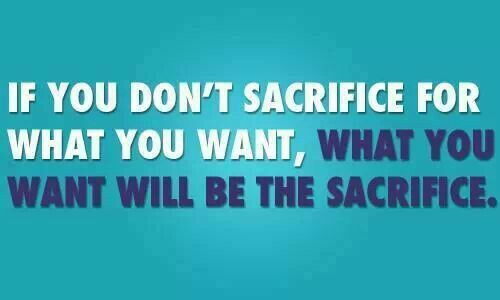 Sacrifice for what you want. If you want that good relationship with your child, put the sacrifice of time in to attain that. I know sometimes (often times) being a mom is hard, thankless, tiring work. Some days are really brutal. On those days (after you have had your time to get the emotion out) sit back and think about your sacrifice now and what it is doing to help you invest to your future. We are not creatures who “deserve” and easy life of completely fulfilled dreams, whims, and fantasies. How would that help us grow into better people? We are creatures who must toil and work and sacrifice for the things that are worth it in life. That is how we invest into ourselves for the future. As a relatively new mom (my DS is 14 weeks) I really appreciate this post. It has been a hard adjustment and while I know it is worth it I can easily forget that when the going gets rough. Love every last word! :)) thanks!! What Shea said! I love this post.